Unexpected delivery of baby in adult A&E. Floppy and unresponsive… alarm buzzer pulled! What would you do? How would you feel inside? How would you prepare? What would you do next? What happened next? Okay, okay… for a newborn we don’t really do an A to E usually. We think colour, tone, breathing effort, heart rate – but under stress you might forget any NLS if you haven’t been trained. If you haven’t done NLS: rely on what you know. As we’ll see there are some important caveats. Oh, and calling for help early! Poor airway: consider obstruction, suction if anything visible. Put in Guedel and try again. Poor ventilation: regards the squeezing of the bag (bag mask ventilation) remember not too hard, not too soft. Always use air initially and switch to oxygen later if needed. Poor grip: it can be tricky if you’re not used to jaw-thrusting or chin-lifting a baby. The idea is to lift the face into the mask and apply the mask down onto the face. If you are struggling then consider a two-handed technique and get others to give ventilations. It’s NEVER wrong to call for help, this means a neonatal crash call. If in doubt regarding a Step (see above) then repeat it. Whilst time is critical, you should be slow and steady. When the adrenaline is pumping it is easy to give fast inflation breaths, count 1,2… 2,2… 3,2… 4,2… 5,2 to slow yourself down. Intubation and umbilical lines are rarely needed if basics are done well. It’s easy to prioritise chest compressions: DON’T. This is not an adult (see below). Ventilation is the most effective action in neonatal resuscitation. Avoid commencing chest compressions prematurely as they are likely to compete with the performance and assessment of effective ventilation. Ensure that assisted ventilation is being delivered optimally BEFORE starting chest compressions. Put another way: chest compressions are indicated when the heart rate is <60 bpm despite adequate assisted ventilation for 30 secs (chest wall obviously moving with each inflation). Once compressions are started, they should be continued with as little interruption as possible until there is clear evidence of improvement in spontaneous heart rate. *This refers to neonates who require resuscitation and admission to NICU (i.e. a specific population of sick babies). Lawton, B. Neonatal Resuscitation (Part 1) 🎬 Don’t Forget the Bubbles, 2014. Tagg, A. Neonatal Resuscitation (Part 2) 🎬 Don’t Forget the Bubbles, 2014. Goldstein, H. Twenty tips to take your Neonatal Resus to the next level (Part 1), Don't Forget the Bubbles, 2015. Goldstein, H. Twenty tips to take your Neonatal Resus to the next level (Part 2), Don't Forget the Bubbles, 2015. Wyllie, J et al. Resuscitation and support of transition of babies at birth, Resusitation Council UK, 2015. Australian Resuscitation Council. 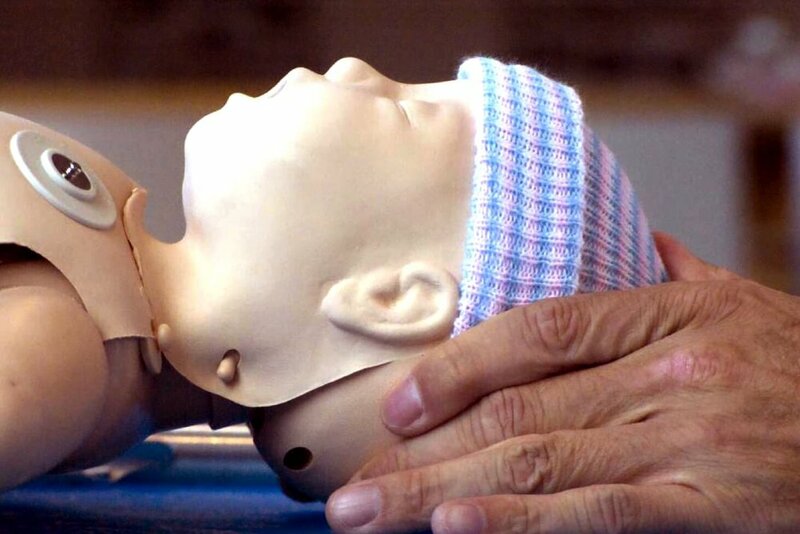 Chest Compressions during Resuscitation of the Newborn Infant, ANZCOR Guideline 13.6, 2016. Why should I know about it? It can make you better under pressure, it can be your secret weapon in your next resuscitation! Like going to the gym, it takes practice. It has been compared to being “kettlebells for the brain”. It is only with practice that the enormous benefits can be gained. How can it help in A&E? A&E is a unique clinical area where decisions are fast-paced with little time to think. As such, anything that can enhance our ability to think under pressure has to be a good thing? Be it an unexpected emergency or a stressful communication scenario. After only 8 weeks we can re-wire our brains! It is suggested on MRI scanning that our amygdala (fear centre) can shrink whilst simultaneously enlargements of our pre-frontal cortex (decision-making centre) can occur. What’s more (with practice) cycling of our thoughts and focus becomes easier and less exertive. Beyond performance in resuscitation, it can enhance resilience and prevent both burnout and compassion fatigue. Tunnel vision, reduced situational awareness, diminished decision making and impairment of teamwork are a few consequences of “stress.” Fixation is also more likely with less dynamism in your diagnostic process. In short – mitigating these effects whilst maximising the benefits of mindfulness truly has the potential to “super-charge” your clinical practice. Focus (or any keyword to bring yourself back into the present): the simple act of focusing on your foot steps as you walk to a resus and re-focusing if your mind wanders can bring your physiological and psychological state into balance, making you at your best! You can learn more about mindfulness meditation in Scott Weingart’s SMACC talk “Kettlebells for the Brain” and “Cognitive paths through chaos”. LeBlanc, Vicki R. 2009. The Effects of Acute Stress on Performance: Implications for Health Professions Education. Academic Medicine: Journal of the Association of American Medical Colleges 84 (Supplement): S25–33. Morgenstern, J. 2017. Performance Under Pressure. First10EM. Carley, S. 2018. JC: The Zero Point Survey. Optimising resuscitation teams in the ED. St. Emlyn’s. Chen, PW. 2009. How Mindfulness Can Make for Better Doctors. The New York Times. Chung, AS. Mindfulness and the Emergency Medicine Mind 🎧 EMRA Wellness Guide.